What does today’s executive need to know? How should he or she proceed in managing through a time of great change? James M. Kerr’s new book, The Executive Checklist: A Guide for Setting Direction and Managing Change is designed to help answer those questions. What does today’s executive need to know? How should he or she proceed in managing through a time of great change? 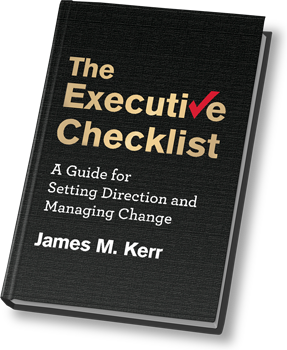 James M. Kerr’s new book, The Executive Checklist: A Guide for Setting Direction and Managing Change is designed to help answer those questions. In this showcase of a business transformation philosophy wrought over 20 years of consulting work, Kerr presents an astonishingly comprehensive set of lists and examples for the situations faced by today’s senior executive. And while the format of the book implies a methodological approach to management, Kerr emphasizes the human factor of character as the first prerequisite of success: Leadership. This is a book written to inform and inspire leaders in all industries, but it is perhaps especially relevant for IIR readers as Kerr – himself an IIR contributor – has spent the lion’s share of his two-decade career working within the insurance industry, with industry leading companies such as AXA Financial, The Hartford, Aetna and Mitsui Sumitomo, among others. Insurance Innovation Reporter: Surely nobody gets to the executive stage without having checklists of their own, perhaps many of them. What does your book add to what the typical executive already knows? James M. Kerr: Well, we have entered a new commercial age, and the tips and tricks that worked in the past may no longer have resonance. The maturity of SCAM – social, cloud, analytics and mobile – technologies, coupled with a more discerning, less patient consumer has led us to a place in time where the business models from the past that relied heavily on size and leverage will no longer deliver returns. Regulatory restructuring, the emergence of Gen Y workforce and the call for transparency only make an Executive’s life more challenging. So, I wrote The Executive Checklist as a way to introduce a fresh set of ideas and approaches to address these newly emerging challenges. James M. Kerr, author, consultant, contributor. IIR: Do you see your book as a kind of reference work then? How should readers use your book? JK: First and foremost, The Executive Checklist presents a business transformation philosophy. But its format lends itself to easy reference, too. The checklist layout allows the reader to skip to the chapters that most interest them and to explore the ideas related to a particular checklist topic. The sidebars sprinkled throughout each chapter provide important examples from industry that fortify the checkpoints presented. IIR: Apart from the sheer breadth of topics in the book, The Executive Checklist is also designed as a kind of guide for managing change. Did you intend it as a kind of “innovator’s manual”? JK: There is no doubt; innovation has to be a kind of core competency for executives during a time of change. From that perspective, The Executive Checklist can be seen as an innovator’s manual. It is chock full of ideas about how to shift an organization to a more innovative culture – one that leverages new ideas and instills creative thinking into all that it does. IIR: The Executive Checklist is clearly also about something beyond competency. Your first two chapters are about leadership, and later chapters have a strong leadership component. JK: John Quincy Adams once said, “If your actions inspire others to dream more, learn more, do more and become more, you are a leader.” The book is very much about reminding us of these facts, and, offering suggestions about how to be that kind of leader. IIR: You say that CIOs need to “Define Where Technology Fits”; what do you mean, and how would you apply that specifically to insurance CIOs? JK: “Define where IT fits” is a reference to the need to CIOs to become intimate with their organization’s vision and strategic plan, so to be better equipped to bring technology solutions forward and enable strategic achievement for their enterprises. 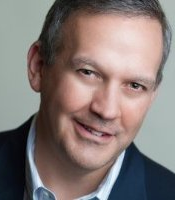 Insurance CIOs are no exception. The challenge for them is to take evolving technologies such as gamification and the “Internet of things” concept and incorporate them into carrier solutions. We’ve already seeing some of that with chips installed in cars to monitor driving habits and gather crash data, etc. IIR: Insurers are concerned about what to do next, but you emphasize the importance of “Knowing What You Have” first. Could you elaborate? JK: Sure, this speaks to the need for executives to understand what technologies and IT capabilities are already available within their concerns, so that they can leverage what exists. It’s amazing just how often technology is being underutilized because management teams don’t fully understand the processing power that they already possess. IIR: One of the pleasures of your book is the wealth of standalone case study examples involving well-known companies and other entities. How did you collect them, and what criteria did you apply in drafting them? JK: Well, it’s been said that great writers write what they know. While I may not be a great writer, I did attempt to discuss topics that I knew a lot about and provide ideas and insights from my own experiences. That said, the case studies that are offered in each chapter come from either an example that I experienced, first hand with a client or were derived from my research on the topic. All were pared down to get at the essential lesson as a means to illustrate a point brought out in the book. IIR: You give a kind of research project to readers, saying that executives must familiarize themselves with the emerging technological trends that are reshaping business strategies. How do you recommend that they do that? JK: How do you get to Carnegie Hall? Practice, man, practice! Executives must be deliberate about taking time to learn and perform research. This means developing a habit of, and a rhythm for, consuming business news and ideas. The best ideas and business strategies typically have a technology underpinning. Translating those ideas into action, of course, is the work of strategy setting and planning. IIR: You mention the need to “regularly mind the gaps between current thinking and the world of possibilities.” Is this a tool for “future proofing” one’s strategic outlook? JK: Absolutely! The best vision and strategies comes with the confluence of today’s realities and tomorrow’s possibilities – so, dream dreams, but, be willing to do what it takes to make them come true. IIR: You close The Executive Checklist with a vision for the future. 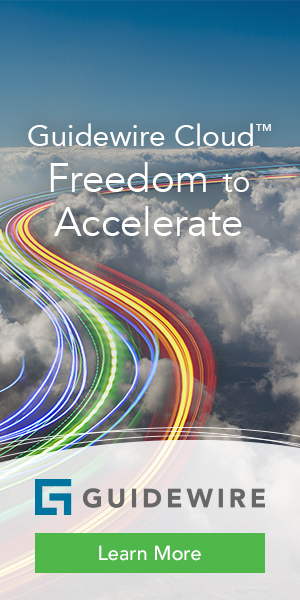 How does it differ from a point of view from, say, a decade earlier, and what are some of the biggest challenges for organizations to realize the vision you present? JK: I tried to make my vision for the future timeless. I want it to track well and evolve over time. So, if we were to look backward, I would expect to see the same concepts – in it together leadership, outside-in perspective, flatter, team-based organization, and so on – the only difference would be the terms we use to describe the concepts. Ah, and, the challenges, then and now, are the same, too – it’s the people. The technology part is easy – it naturally evolves and matures. The people part of the equation is less predictable. Much of The Executive Checklist is about re-imagining how to engage, motivate and drive the changes needed to truly transform the enterprise. I hope that the ideas presented are used to make a difference.